The rug is very wrinkled, but quality is good. Dimensions 35.0 In. X 21.0 In. X 0.3 In. 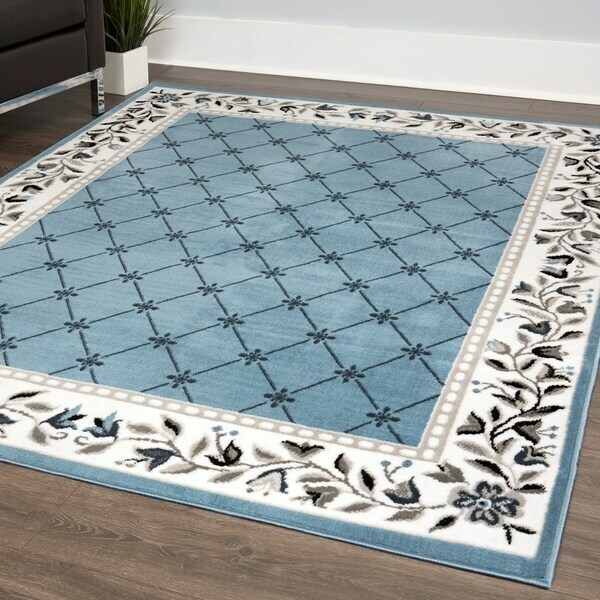 Option: blue/ivory - 8' x 10' - 7'8"x10'7"
Love my rug. I looked all over for this color. Looks really nice in my living room. It looked just like the photo & I got a great price on it. Overstock is my go to store for whatever I need for my home. Their service & prices are great. Option: gray/ivory - 2' x 3' - 21"x35" | gray/ivory - 3' x 5' - 3'7"x5'2" | gray/ivory - 8' Runner - 1'9"x7'2" | gray/ivory - 8' x 10' - 7'8"x10'7"
Option: gray/ivory - 8' x 10' - 7'8"x10'7"